It is light weight or heavy weight, depending on how it is spun. It is soft, durable, luxurious and silky. It is similar to wool although it is not prickly, and has no lanolin which makes it hypoallergenic. Alpaca is naturally water-repellent and difficult to ignite. The Huacaya alpaca grows soft spongy fiber that has natural crimp which make a naturally elastic yarn well-suited for knitting. Alpaca fleece is made into various products, from very simple and inexpensive garments made by the aboriginal communities to sophisticated, industrially made and expensive products such as suits. It is also used in the Cottage Industry for many projects such as needle felting, nuno felting, weaving, etc. Many spin their own fiber and create beautiful items such as sweaters, hats, scarves, gloves, socks; the list goes on and on. 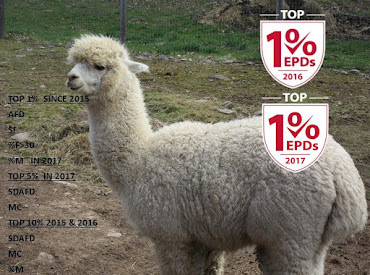 In the United States, groups of smaller alpaca breeders have banded together to create "fiber co-ops" in order to make the manufacture of alpaca fiber products less expensive. Alpaca fiber is processed in three ways, carding , spinning and weaving. Raw fiber is when nothing has been done to process it. In Peru this fiber was used in the manufacture of many styles of fabrics for thousands of years before its introduction into Europe as a commercial product. 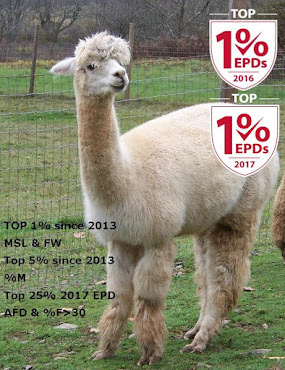 In recent years, interest in alpaca fiber clothing has surged, perhaps partly because alpaca ranching has a reasonably low impact on the environment. 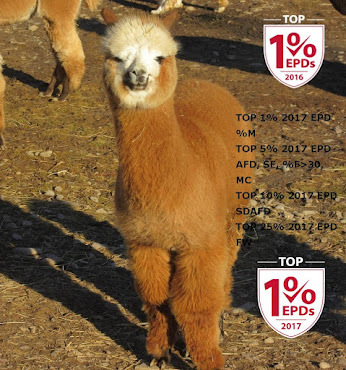 Individual U.S. farms are producing finished alpaca products like hats, scarves, and footwarmers. Outdoor sports enthusiasts recognize that its lighter weight and better warmth provides them more comfort in colder weather, so outfitters are beginning to stock more alpaca products. Alpaca fiber is similar to that of merino wool fiber, and alpaca yarns tend to be stronger than wool yarns. The heel hole that appears in wool socks or in elbows of wool sweaters is nonexistent in similar alpaca garments. The alpaca has a very fine and light fleece. It does not retain water, is thermal even when wet and can resist the solar radiation effectively. These characteristics guarantee the animals a permanent and appropriate coat to fight against the extreme changes of temperature. This fiber offers the same protection to humans. Alpacas as animals are soft on the environment, making alpaca a truly green textile. 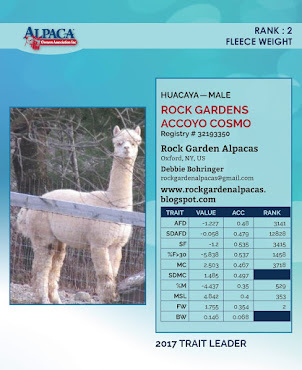 Good quality alpaca fiber is approximately 18 to 25 micrometres in diameter. Finer fleeces, ones with a smaller diameter, are preferred, and thus are more expensive. 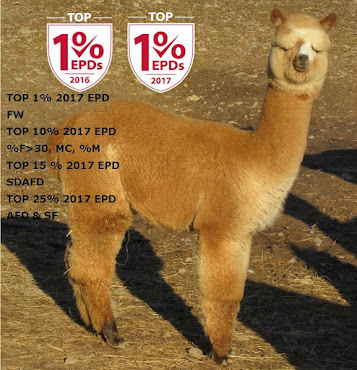 As with all fleece-producing animals, quality varies from animal to animal, and some alpacas produce fiber which is less than ideal. 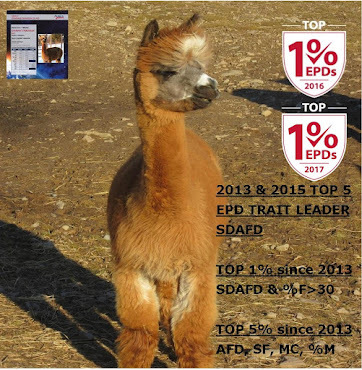 Fiber and conformation are the two most important factors in determining an alpaca's value. Ultra-fine: Grade 1 - having less than 20 microns - is best used for making items that will be worn next to the skin, baby items, underwear, etc. Super-Fine: Grade 2 - having a micron of 21 to 22.9 for gently used items, scarves and shawls. Fine - Grade 3 - the most versatile grade having a micron of 23 to 25.9 can be used for yarns, socks, and knitted wear. Medium - Grade 4 - having a micron of 26 to 28.9 can be used for socks, throws, yarn, outerwear or felt. Intermediate - Grade 5 - having a micron of 29 to 31.9 can be used for Batts, divets, outerwear and felt. 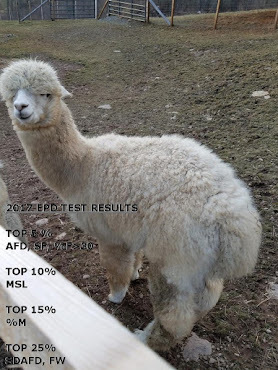 Robust - even fibers from the leg belly and chest with very high micron can be used for making beautiful alpaca rugs or for insulation, even garden mulch. Alpacas come in many shades from a true-blue black through browns-black, browns, fawns, white, silver-greys, and rose-greys. However, white is predominant, because of selective breeding: the white fiber can be dyed in the largest ranges of colors. In South America, the preference is for white as they generally have better fleece than the darker-colored animals. This is because the dark colors had been all but bred out of the animals. The demand for darker fiber sprung up in the United States and elsewhere, however in order to reintroduce the colors, the quality of the darker fiber has decreased slightly. 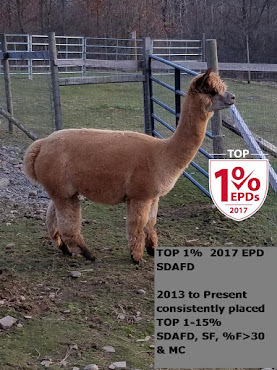 Breeders have been diligently working on breeding dark animals with exceptional fiber, and much progress has been made in these areas over the last 5–7 years.